The Tea Files go global, baby! For ages now I've wanted the opportunity to step outside of my typical London locations for afternoon tea and since I was headed to Dubai I finally got the chance! Last week I was extremely lucky to visit the gorgeous Burj Al Arab with my mama to finally try their afternoon tea. If you're not familiar with the hotel, it's 7 star, shaped like a sail, and pretty much the epitome of luxury. Yes, I'm sure Miranda Priestley would be recoiling in horror at my dress choice for today's post, but, to quote another film favourite; "Frankly my dear, I don't give a damn." If you didn't already know, I'm currently in Dubai! I've been looking forward to this trip for ages, mostly because of the opportunity for good Instagram photos, the opportunity for good blog posts and the opportunity to wear all my fancy dresses without having to have some kind of elaborate excuse. Yesterday, my mama and I were lucky enough to go for afternoon tea at the Burj Al Arab (what I can only describe as the most stunning hotel in the world, but more on that later), but of course this meant only one thing; cheeky outfit snaps. I should probably put a quick disclaimer on this post that none of these are really blogger essentials in that if you don't have them then you're positively NOT A BLOGGER and you need to quit straight away because you prefer silver over rose gold. They're more like things I want that I think would make blogging for me a little easier or better. And before you say anything, yes, fake peonies are a necessary addition to my life. The one thing I've been lusting after for a little while has to be a smaller camera. As much as I love lugging around my DSLR, it would be nice to have a smaller one for general use. This would also mean opening up a whole new world of smaller handbags...yay! You can also change the lens on the Panasonic DMC-LX7, which makes me very happy indeed. In the other realm of cameras is the 40mm lens which I have been looking at purchasing to join my 50mm. I've heard nothing but good things about it, so definitely would love to give it a spin. Other bits a bobs are pretty much just for flatlay purposes, such as the marble contact paper, the artificial flowers and the faux sheepskin. I'm definitely becoming more and more obsessed with my Instagram account and I'm turning into one of those nutters who buys props specifically for flatlay purposes. The headphones are really not essential at all, but my god are they pretty (yep, I'm still thinking flaylays in my head). Also, who doesn't need a set of headphones to block out the world while you're deep in your writing zone? I've also placed a handy dandy list of my favourite photo editing apps on here, although I already have these! They all do their part in making my Instagram feed something I'm proud of, although I am a big fan of Instagram's own filters too. Also, just so we all know I use the Airbrush app to erase blemishes from flatlays, not to make myself look skinner or anything! 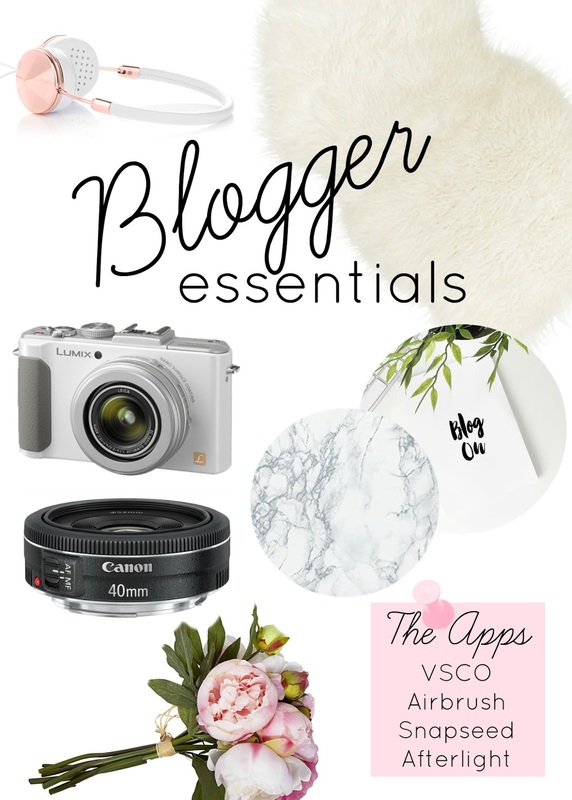 So that's my blogger essentials wishlist! Let me know in the comments if you've been lusting after any blog related goodies, or if there's anything you think I NEED! This post is kindly sponsored by Panasonic but all opinions on unnecessary essential items are my own. Something I've been absolutely obsessed with lately is Snapchat. As you know, I haven't got what I could describe as a 'functioning' Youtube channel, despite trying to start one a couple of times. The honest truth is I love creating video content, but editing and uploading and all that long stuff bores me to tears. But, Snapchat is pretty much my paradise. I can create video content every single day and upload it instantly without editing. It's the dream. Ever since I got my new iPhone (which, by the way, is my baby), I've been doing pretty much the most risky thing an iPhone owner can do; walk around without a case. To be fair I've been holding onto it with dear life as much as possible, but I was pretty aware that it would soon be time to get a proper case for it. So when the lovely people at GoCustomised got in touch and offered to send me one of their cases to try, it was pretty much perfect timing. Yesterday I had the pleasure of hanging out with two of my favourite girlies, Ellie and Lauren, for a spot of lunch. Lauren was adamant we try out Mildred's, a vegan and vegetarian restaurant in a little street in Soho. Now, ever since watching a video that contained some adorable cows in it I have been trying my best to stick to a pescatarian diet, so I was so excited to try out some proper vegetarian food! A couple weeks ago, the lovely people at Talented Talkers invited me down to the Fitness First gym in Brighton for a little drop in session! I've been getting back into the gym a lot more this year after a little bit of Christmas weight appeared...no idea where that could have come from! Something I love about getting a new fragrance is the idea that the new scent could represent a brand new me, a new chapter of my life. I've been on the search for years now for the one perfume, my signature scent, but to be honest I love relating scents to experiences. The newest addition to the timeless Chloe fragrance family is the beautiful Love Story Eau De Parfum*; a lovely light, floral fragrance that is perfect for everyday. It combines the notes of orange blossom with stephanotis jasmine, which is the flower of happiness, don'tcha know!